A beautiful e.e. cummings love poem is hand-printed onto Tori Tissel's semi-sheer cotton knit scarf. Everybody says "I love you." e. e. cummings said it better than most. "i carry your heart with me (i carry it in my heart)." Does it get more romantic than that? 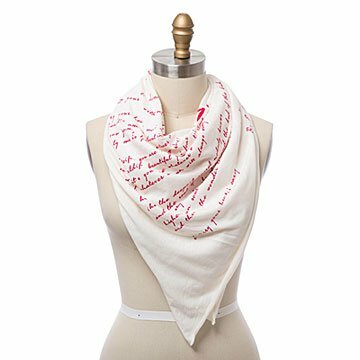 The entire, gorgeous, 15-line poem is hand-silkscreened in red cursive text on Tori Tissel's semi-sheer, cotton knit scarf. A swoopy, hand-drawn heart underlines the message. Cummings strove to blur the lines between visual and literary art, so this poem doesn't just read beautifully, it looks great. Luxurious and lightweight with a serged hem, this square-shaped scarf is a breath of fresh air, just like the poem. Handmade in Oregon. Spot treat recommended or a gentle wash cycle in cool water. Hang or lay flat to dry. Warm iron okay. I gave this to my wife for Hanukkah and she absolutely loves it! She wears with over a shirt or for warmth during Fall and early Winter. She really loved the sentiment behind it, too. This is a great lightweight scarf for cool weather. Adds an interesting pop to your outfit. We also find that it works great as a coverup for breastfeeding! I would note that it is more square-shaped than your average scarf.